The Paris Air Show (Salon international de l'aéronautique et de l'espace de Paris-Le Bourget, Salon du Bourget) is the largest aerospace-industry exhibition type Air Show in the world, measured by number of exhibitors and size of exhibit space. In second place is UK's Farnborough, followed by Dubai Air Show or Singapore Airshow. The latest was the 52nd Air Show, held from 19 to 25 June 2017, attended by 3,450 journalists, 142,000 professionals and 180,000 general public visitors. It claims to be the world's calendar-oldest air show. Established in 1909, it has been held every odd year since 1949 at Paris–Le Bourget Airport in north Paris, France. It is a large trade fair, demonstrating military and civilian aircraft, and is attended by many military forces and the major aircraft manufacturers, often announcing major aircraft sales. It starts with four professional days and is then opened to the general public followed from Friday to Sunday. The format is similar to Farnborough and the ILA, both staged in even years. It is organised by the French aerospace industry's primary representative body, the Groupement des industries françaises aéronautiques et spatiales (GIFAS). The Paris Air Show traces its history back to the first decade of the 20th century. In 1908 a section of the Paris Motor Show was dedicated to aircraft. The following year, a dedicated air show was held at the Grand Palais from 25 September to 17 October, during which 100,000 visitors turned out to see products and innovations from 380 exhibitors. There were four further shows before the First World War. The show restarted in 1919, and from 1924 it was held every two years before being interrupted again by the Second World War. It restarted in 1946 and since 1949, has been held in every odd year. The air show continued to be held at the Grand Palais, and from 1949 flying demonstrations were staged at Paris Orly Airport. In 1953, the show was relocated from the Grand Palais to Le Bourget. The show was drawing international notice in the 1960s. Since the 1970s, the show has emerged as the main international reference of the aeronautical sector. The 1967 air show was opened by French President Charles de Gaulle, who toured the exhibits and shook hands with two Soviet cosmonauts and two American astronauts. Prominently displayed by the Soviet Union was a three-stage Vostok rocket, such as the one that had carried Yuri Gagarin into space on April 12, 1961. The "extraordinarily powerful" Vostok was downplayed by American missile experts as "rather old and unsophisticated.". The American exhibit, the largest at the fair, featured the F-111 swing-wing fighter bomber, a replica of Charles Lindbergh's Spirit of St. Louis. and the Ling-Temco-Vought XC-142A, a cargo plane capable of a vertical takeoff and landing. A full-size model of the supersonic Concorde was displayed by the French and British, auguring its successful first flight on March 2, 1969. "The largest plane in the world," the Boeing 747 jet airliner, arrived on June 3, after flying non-stop from Seattle, Washington, and the Apollo 8 command module, charred by its re-entry, was there flanked by the Apollo 9 astronauts, but the most-viewed exhibit was the supersonic Concorde, which made its first flight over Paris as the show opened. The Soviet TU-144 supersonic airliner was flown to Le Bourget for the 1971 show, drawing comparisons with the French Concorde. Landing with the Concorde was the world's largest aircraft, the American Lockheed C-5A Galaxy. The crash of the Soviet Tu-144, see below, overshadowed the 1973 show, otherwise characterized by "There was nothing new", although the flying was memorable, and there were a great many exhibits. One hundred and eighty-two aircraft were scheduled for appearance. Despite restrictions that followed the TU-144 crash in 1973, a day of flying pleased viewers. In particular, the American YF-16 and the French Mirage F-1E competed in turn before a critical audience. Days later, Belgium became the fourth European nation to choose the YF-16 over the F-1E. Celebration of Charles Lindbergh's trans-Atlantic flight to Le Bourget fifty years ago recalled that historic event. Anne Morrow Lindbergh, Lindbergh's widow, attended the ceremony along with early trans-Atlantic pilots, Maurice Bellonte and Armand Lotti. Recent extension of coastal limits to 200 nautical miles has produced new maritime-reconnaissance (MR) aircraft. The crash of a Fairchild A-10 tank-destroyer led to tightened rules on air show demonstrations. Two airliners, the Airbus A310 and the Boeing 767, are competing for the international market, but neither will carry passengers before 1982. The Westland WG30 transport helicopter shows promise. "The Mirage 4000 remains a question mark" despite being "surely the main highlight this year at Le Bourget." Exhibiting at the show, Airbus, Boeing, and McDonnell Douglas/Fokker vie for the 150-seat airline market, while Rolls Royce/Japan, General Electric/Snecma (CFM), and Pratt & Whitney contest for their engines. The Northrop F-5G Tigershark mockup was on display and expected to fly in 1982 with delivery the following year. A novelty was Air Transat, a light aircraft trans-Atlantic race from Le Bourget to Sikorsky Memorial Airport, Bridgeport, Connecticut and back, won by a twin engine Piper Navaho and a Beechcraft Bonanza. The American Space Shuttle Enterprise was flown around Paris and towered over other exhibits, but "much more intriguing" were replicas of two twin-engined fighters, the British Aerospace ACA and French Dassault Breguet ACX. Sales of Boeing 757 and Airbus A310 airliners to Singapore Airlines were welcome news during an ongoing recession. The Soviet Antonov An-124 Ruslan military heavy lifter was the largest exhibit in 1985. Propfan engines stirred interest. Reflecting the upturn in the economy, Boeing and Airbus announced new contracts totaling as much as $1,700 million. The Hubble space telescope should be deployed in 1986. Newly introduced, in the rain, were the Soviet Mil Mi-34 Helicopter, the Israeli Super Phantom, and the Harrier GR.5. Airbus announced firm orders for both the A330 and A340 airliners. Exhibiting at the show for the first time, the Chinese displayed, among others, the A-5C Attacker (Fantan) and FT-7. Richard Rutan and Jeana Yeager, who flew a Voyager non-stop around the world without refueling, were present, but their aircraft was not. The "38th Paris International Air and Space Show" or "1989 Paris Air Show", featured a variety of aerospace technology from NATO and Warsaw Pact nations. A Mikoyan MiG-29 crashed during a demonstration flight with no loss of life. The then-Soviet space shuttle Buran and its carrier, Antonov An-225 Mriya, was displayed at this show. Despite a Department of Defense display of the Stealth bomber and other Gulf War armaments, most American contractors stayed home, so Soviet aircraft drew attention, among them the Beriev Be-42 Mermaid (A-40 Albatros) amphibian, the MiG-31 Foxhound interceptor, and the Yak-141 short take-off/vertical landing (ASTOVL) supersonic fighter. When it receives its first customer order, Dassault plans to begin production of the Mirage 2000-5, which is a "new machine compared to the basic Mirage 2000." The show attracted 1,611 exhibitors from 39 countries and nearly 300,000 visitors attended the show. Dassault featured the debut of the Falcon 2000, and Airbus will manufacture the 130-seat A319. The 41st Paris Air Show main attraction was the stealth B-2 Spirit bomber, along with the Tupolev Tu-160 and Sukhoi Su-32 bombers. The flying display included the Bell-Boeing V-22 tilt-rotor, the Airbus Beluga Super Transporter, the Eurofighter 2000, the Rockwell-MBB X-31 high-manoeuvrability fighter demonstrator, the McDonnell Douglas C-17 military transport, the Eurocopter EC135 civil helicopter, the Sukhoi Su-35 fighter, and the Daimler-Benz Aerospace Dornier 328-100, and for the first time on static the Boeing 777, Saab Gripen, Atlas Cheetah Mirage and Cessna Citation X.
America Eagle announced purchase of forty-two EMB-145 regional jets from Embraer and twenty-five Bombardier CRJ700 airliners from Bombardier. Spectators saw two Eurofighter Typhoon EF2000s flying together. A full-scale mock-up of the Bell Boeing 609 civil tilt-rotor aircraft attracted attention. IAR Brasov featured a prototype Anti-Tank Optronic Search and Combat System (SOCAT) helicopter, an upgrade of the IAR-330 Puma. The 1999 show continued a trend away from displays of new aircraft toward announcements of new contracts. Although new entries such as the Fairchild 30-seat 328JET and the Boeing 100-seat 717-200  attracted interest, airlines ordered as many as 103 Embraer ERJ-135s and 145s in addition to a 4.9 billion-dollar order for ERJ-170s and ERJ-190-200s. In February, the Russian Il-103 received US Federal Aviation Administration (FAA) approval, a breakthrough in certifying Russian aircraft for the American market. Subsequent certification for the Ilyushin Il-96T wide-bodied jet was displayed at the show. Boeing introduced scale models of their Sonic Cruiser which would reach speeds approaching Mach 0.98, together with a walk-through hologram. The Airbus A380, seating 555, offered size rather than speed, and was there on the tarmac. Crowds toured the restored Antonov An-225 Dream, the world's largest aircraft. Dassault featured a model of the new Falcon FNX business jet that is projected to fly 10,500 kilometers at Mach 0.88. The Joint Strike Fighter (JSF), which is undergoing STOVL testing, is a likely replacement for older American F-15E Strike Eagles and F-117 Nighthawks. The Concorde F-BTSD made its farewell landing at Le Bourget on June 14, the opening day, and the Dassault's Mirage 2000 and Rafale put on a show overhead. Pilotless planes, such as the Northrop Grumman RQ-4 Global Hawk and General Atomics Predator drew attention. Boeing publicized the 7E7 Dreamliner. FlightGlobal cited the Airbus A380 and "nineteen remarkable first appearances," including Dassault's Falcon 7X and Gulfstream's G550 business jets, Embraer's EMB-195 regional jet, and the second prototype of Alenia Aermacchi's M-346 advanced jet trainer. CompositesWorld added the Boeing 777-200LR and the Dassault UCAV Neuron. The Boeing 787 Dreamliner sold briskly, as did the Airbus A380 and A350 XWB. A mockup of the Lockheed Martin Joint Strike Fighter was on display. The IAI Heron TP UAV is ready to enter production. The Spanish steer-by-leaning AN-1 AeroQuad flying platform from Aeris Naviter weighed only 100 kilograms. The 48th International Paris Air Show took place in 2009 and marked a hundred years of technological innovation in aeronautics and space conquest. The event was held from 15 to 21 June, at Le Bourget. A memorial service was held for the victims of Air France Flight 447. The 2011 show was the 49th presentation, and hosted over 2,100 international exhibitors in 28 international pavilions. A total of 150 aircraft were on display, including the solar-electric aircraft Solar Impulse. A demo A380 was damaged the day before the exhibition opened and needed a replacement; while the new Airbus A400M Atlas military transport aircraft had an engine failure, but could still perform some demonstration flights. The 2015 show, held from June 15 to June 21, 2015, saw the new Dassault Falcon 8X, Airbus A350 XWB and Bombardier CS300 and received 351,584 visitors, 2,303 exhibitors over 122,500 square metres of exhibition space, 4,359 journalists from 72 countries and 130 billion euros in purchases and "cemented its position as the world's largest event dedicated to the aerospace industry". During the show, Airbus Helicopters announced a successor to the Super Puma, called the Airbus Helicopters X6. The 53rd Air Show will be held from 17 to 23 June 2019. A Convair B-58 Hustler crashed while doing low-altitude aerobatics. The aircraft reportedly flew into a cloud bank, where visual reference was lost, and crashed. Another Convair B-58 crashed while on final approach during an overweight landing. The aircraft touched down short of the runway, killing United States Air Force Lt. Colonel Charles D. Tubbs. Two other crewmen were injured. A Fairchild-Hiller FH-1100 helicopter crashed killing the pilot. Witnesses of the crash cite seeing "something wrong with the main rotor". At the Paris Air Show on June 3, 1973, the second Tupolev Tu-144 production aircraft (registration SSSR-77102) crashed during its display. It stalled while attempting a rapid climb. Trying to pull out of the subsequent dive, the aircraft broke up and crashed, destroying 15 houses and killing all six on board and eight on the ground; a further sixty people received serious injuries. The cause of this accident remains controversial. Theories include: the Tu-144 climbed to avoid a French Mirage chase plane whose pilot was attempting to photograph it; that changes had been made by the ground engineering team to the auto-stabilisation circuits to allow the Tu-144 to outperform the Concorde in the display circuit; and that the crew were attempting a manoeuvre and to outshine the Concorde. An A-10 Thunderbolt crashed killing the pilot. A Mikoyan MiG-29 crashed during a demonstration flight with no loss of life. A Sukhoi Su-30MKI crashed during a demonstration flight with no loss of life. ^ a b c d "52nd International Paris Air Show Paris-Le Bourget 19-25 June 2017" (PDF) (Press release). GIFAS. 28 June 2017. ^ Bill Carey. "U.S. Military a No-show At 2013 Paris Air Show". AIN Online. Retrieved 2013-09-07. 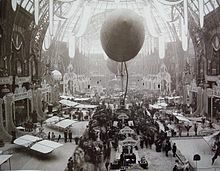 ^ "The First Paris Aeronautical Salon" Flight January 2, 1909. ^ "Show History". Paris-air-show.com. Retrieved 20 March 2011. ^ "special paris | salon | side entrance | 1912 | 0990 | Flight Archive". Flightglobal.com. Retrieved 2012-10-15. ^ www.minit-l.net, Agence Minit-L,. "Le Salon du Bourget, témoin de l'histoire de l'aéronautique et de l'espace - Entrevoisins.org". www.entrevoisins.org. Retrieved 4 April 2018. ^ "1945 à 1960". www.parisaeroport.fr. Retrieved 4 April 2018. ^ a b "De Gaulle Opens Air Show in Paris". New York Times. New York, New York. UPI. May 27, 1967. p. 15. Retrieved September 19, 2018. ^ "Salon du Bourget - Salon international de l'aéronautique et de l'espace". www.promosalons.com. Retrieved 4 April 2018. ^ a b c Mooney, Richard E. "Soviet Competes with U.S. in Paris." New York Times. May 26. 1967. 92. ^ "Replica of Famous Plane Sent to Paris". Los Angeles Times. California, Los Angeles. May 15, 1967. p. 24. Retrieved September 19, 2018 – via Newspapers.com. ^ Jones, Jack (May 14, 1967). "Base Pilot Taking F-111 to Paris". Dayton Daily News. Ohio, Dayton. p. 56. Retrieved September 19, 2018 – via Newspapers.com. ^ Witkin, Richard. "Supersonic Concorde Airliner Successful in 28-Minute Maiden Flight." New York Times. March 3, 1969. 1. ^ "Boeing 747 Jumbo Jetliner Flown to Paris Air Show". New York Times. New York, New York. June 4, 1969. p. 94. ^ "Concorde Flies Over Paris". New York Times. New York, New York. May 30, 1969. p. 40. ^ "Soviet SST, in Its First Flight to the West, Arrives in Paris for Air Show". New York Times. New York, New York. May 26, 1971. p. 3. ^ "Soviet SST Arrives for Paris Air Show". Los Angeles Times. California, Los Angeles. May 26, 1971. p. 6. Retrieved September 23, 2018 – via Newspapers.com. ^ "'74 Service Due for Both Soviet and Concorde". New York Times. New York, New York. May 29, 1971. p. 46. ^ Angove, Rodney (May 27, 1971). "Soviet. British-French SST Compared". Tampa Tribune. Florida, Tampa. p. 73. Retrieved September 23, 2018 – via Newspapers.com. ^ "World's Biggest Aircraft Now At Paris Show". Times Record. New York, Troy. UPI. May 26, 1971. p. 2. Retrieved September 23, 2018 – via Newspapers.com. ^ Field, Hugh (June 7, 1973). "Paris Show Review". Flight International: 865–67. Retrieved September 25, 2018. ^ "Other Countries". Flight International: 805–09. May 24, 1973. Retrieved September 25, 2018. ^ "Au Bourget… The aircraft on show". Flight International. 107 (3455): 862. May 29, 1975. Retrieved September 26, 2018. ^ "Apres Le Bourget". Flight International. 107 (3457): 931–32. June 12, 1975. Retrieved September 26, 2018. ^ "Apres Le Bourget… F-16 carries it off". Flight International. 107 (3457): 934. June 12, 1975. Retrieved September 25, 2018. ^ "1927-1977: Golden Lindbergh". Flight International. 111 (3560): 1650–53. June 4, 1977. Retrieved September 27, 2018. ^ a b c "Lone Eagle, Concorde and A-10 Dominate Air Show". New York Times. June 5, 1977. Retrieved September 27, 2018. ^ "Paris defenders". Flight International. 111 (3561): 1687. June 11, 1977. Retrieved September 27, 2018. ^ Pullan, Patricia (June 16, 1977). "Lean budgets haunt air show". Baltimore Sun. Retrieved September 27, 2018. ^ Rek, Bron (June 9, 1979). "Paris Special: A310 vs 767". Flight International. 115 (3664): 2003–06, 11. Retrieved September 28, 2018. ^ Lambert, Mark (June 9, 1979). "Paris Special: Westland WG30: first analysis". Flight International. 115 (3664): 2016–20. Retrieved September 28, 2018. ^ "Mirage 4000: Dassault's independent delta". Flight International. 115 (3664): 2077. June 9, 1979. Retrieved September 28, 2018. ^ "Paris Report: Defense". Flight International. 115 (3665): 2152. June 16, 1979. Retrieved September 28, 2018. ^ Learmount, David (June 13, 1981). "Is three a crowd?". Flight International. 119 (3762): 1812. Retrieved September 30, 2018. ^ Hutchinson, Jeff (May 30, 1981). "Transatlantic Air Race in view". Flight International. 119 (3760): 1597. Retrieved September 30, 2018. ^ Carman, Gerry (July 18, 1981). "Honor without price". The Age. Melbourne, Victoria, Australia. p. 24. Retrieved September 30, 2018. ^ "First Sheriff order announced". Flight International. 120 (3785): 1546. November 21, 1981. Retrieved September 30, 2018. ^ Aplegren, Janne (June 2, 1983). "Space Place". The Age. Melbourne, Victoria, Australia. Retrieved October 1, 2018. ^ "Gemini". Flight International. 123 (3865): 1617. June 4, 1983. Retrieved October 1, 2018. ^ "BAe gets ACA go-ahead". Flight International. 123 (3865): 1621. June 4, 1983. Retrieved October 1, 2018. ^ "Dassault unveils ACX". Flight International. 123 (3865): 1621. June 4, 1983. Retrieved October 1, 2018. ^ "SIA peps order books". Flight International. 123 (3866): 1734. June 11, 1983. Retrieved October 1, 2018. ^ "Big man from Antonov". Flight International. 127 (3963): 3–4. June 8, 1985. ISSN 0015-3710. Retrieved October 2, 2018. ^ "Propfans ready by 1990". Flight International. 127 (3963): 5. June 8, 1985. ISSN 0015-3710. Retrieved October 2, 2018. ^ "Billion dollar airliner sales for leasing deals". Flight International. 127 (3963): 13. June 8, 1985. ISSN 0015-3710. Retrieved October 2, 2018. ^ Anderson, Ian (June 10, 1985). "Giant eyes peer deep into space". The Age. Melbourne, Victoria. p. 13. Retrieved October 2, 2018. ^ "Space Telescope nears completion". Flight International. 127 (3963): 39. June 8, 1985. Retrieved October 2, 2018. ^ "Soviets unveil Mil Mi-34". Flight International. 131 (4067): 2. June 20, 1987. ISSN 0015-3710. Retrieved October 2, 2018. ^ "Super Phantom displayed". Flight International. 131 (4067): 14. June 20, 1987. Retrieved October 3, 2018. ^ Gaines, Mike; Lowe, Janice (July 18, 1987). "Harrier force". Flight International. 132 (4071): 20–23. Retrieved October 3, 2018. ^ "Airbus Industrie reveals A330/A340 customers". Flight International. 131 (4067): 11. June 20, 1987. Retrieved October 3, 2018. ^ "Chinese on show". Flight International. 131 (4067): 12. June 20, 1987. Retrieved October 3, 2018. ^ "White House grounds Voyager". Flight International. 131 (4067): 16. June 20, 1987. Retrieved October 3, 2018. ^ "B-2's changing shape". Flight International. 139 (4271): 101–02, 104. June 12–18, 1991. ISSN 0015-3710. Retrieved October 5, 2018. ^ "Show guide". Flight International. 139 (4271): 50. June 12–18, 1991. Retrieved October 6, 2018. ^ "Empty gestures". Flight International. 139 (4272): 5. June 19–25, 1991. Retrieved October 6, 2018. ^ "Albatross by a head". Flight International. 139 (4263): 36–38. April 17–23, 1991. Retrieved October 6, 2018. ^ "Foxhound breaks cover". Flight International. 139 (4271): 87–88, 90–91. June 12–18, 1991. Retrieved October 5, 2018. ^ "Soviets reveal details of Yak-141". Flight International. 139 (4272): 7. June 19–25, 1991. Retrieved October 5, 2018. ^ Sedbon, Gilbert (June 12–18, 1991). "Dassault's high hope". Flight International. 139 (4271): 95–97. Retrieved October 6, 2018. ^ a b "Preparing for Paris". Flight International. 10 May 1995. ^ Moxon, Julian (June 9–15, 1993). "Economical Falcon". Flight International. 144 (4373): 60–64. Retrieved October 10, 2018. ^ "Airbus launches 130-seat A319". Flight International. 144 (4374): 10. June 16–22, 1993. ISSN 0015-3710. Retrieved October 10, 2018. ^ Barry James (June 12, 1995). "U.S. Bomber Steals the Paris Air Show". The New York Times. ^ Moxon, Julian (May 12–18, 1999). "Paris 99 Preview". Flight International. 155 (4676): 38. ISSN 0015-3710. Retrieved October 12, 2018. ^ Doyle, Andrew (May 5–11, 1999). "Fairchild wraps up 328JET testing and confirms stretch plans". Flight International. 155 (4675): 16. Retrieved October 12, 2018. ^ Gerzanics, Michael (May 26 – June 1, 1999). "Boeing's small adventure". Flight International. 155 (4678): 42–45. Retrieved October 12, 2018. ^ "Embraer pushes stretch plan; $2bn orders take ERJ-135/145 sales to over 900". Flight International. 155 (4682): 23. June 23–29, 1999. Retrieved October 12, 2018. ^ Lopez, Ramon (February 10–16, 1999). "Ilyushin breaks the US barrier". Flight International. 155 (4663): 46–47. Retrieved October 12, 2018. ^ Zuckerman, Laurence (June 18, 1999). "Russians Land a Big One; FAA Gives Stamp of Approval to Ilyusion Cargo Plane". New York Times. Retrieved October 12, 2018. ^ "Boeing model reveals details". Flight International. 159 (4786): 15. June 26 – July 2, 2001. Retrieved October 13, 2018. ^ Zuckerman, Laurence (June 17, 2001). "Boeing Plays an Aerial Wild Card". New York Times. Retrieved October 14, 2018. ^ Learmount, David (June 12–18, 2001). "Big on Safety". Flight International. 159 (4784): 77–78, 81. Retrieved October 14, 2018. ^ "Mriya freighter enters service 13 years after maiden flight". Flight International. 159 (4786): 26. June 26 – July 2, 2001. Retrieved October 14, 2018. ^ "Dassault unveils long-range Falcon". Flight International. 159 (4786): 25. June 26 – July 2, 2001. Retrieved October 14, 2018. ^ Warwick, Graham (June 12–18, 2001). "Battle for Survival". Flight International. 159 (4784): 83–84, 87–88. ^ "Le Bourget last landing for Air France Concorde". Flight International. 163 (4888): 21. June 24–30, 2003. Retrieved October 15, 2018. ^ McHugh, David (June 16, 2003). "Aviation show in Paris delights public". Dayton Daily News. Dayton, Ohio. Associated Press. p. 4. Retrieved October 15, 2018. ^ "SIGINT Global Hawk set for German civil trials". Flight International. 163 (4888): 13. June 24–30, 2003. Retrieved October 15, 2018. ^ La Franchi, Peter (June 10–16, 2003). "Mission possible". Flight International. 163 (4886): 103–4, 106, 108. Retrieved October 15, 2018. ^ "Boeing to change way it works with 7E7 partners". Flight International. 163 (4888): 20. June 24–30, 2003. Retrieved October 15, 2018. ^ Norris, Guy (June 14, 2005). "Creating A Titan". FlightGlobal. Reed Business Information Ltd. Retrieved October 17, 2018. ^ Sarsfield, Kate (May 17, 2005). "Falcon 7X". FlightGlobal. Reed Business Information Ltd. Retrieved October 17, 2018. ^ McClellan, J. Mac (March 20, 2004). "Gulfstream G550". Flying. Bonnier Corporation. Retrieved October 17, 2018. ^ "Flybe chooses Embraer 195 as Bae 146 replacement". Smiliner. June 10, 2005. Retrieved October 16, 2018. ^ "Flight test: Alenia Aermacchi M-346 – One-stop warrier". FlightGlobal. Reed Business Information Ltd. July 18, 2006. Retrieved October 16, 2018. ^ "Top 10 highlights from 50 Paris air shows: 2005". FlightGlobal. Reed Business Information Ltd. June 12, 2015. Retrieved October 16, 2018. ^ Birch, Stuart (June 2005). "Technology update: Paris Air Show preview" (PDF). Aerospace Engineering: 6–7. Retrieved October 16, 2018. ^ "Boeing 777-200LR Worldliner". FlugRevue. Motor-Presse Stuttgart. February 3, 2006. Retrieved October 17, 2018. ^ "Chirac kicks off six-nation Neuron UCAV programme". FlightGlobal. Reed Business Information Ltd. June 14, 2005. Retrieved October 17, 2018. ^ Griffiths, Bob (September 1, 2005). "Paris Air Show Report 2005". CompositesWorld. Gardner Business Media, Inc. Retrieved October 17, 2018. ^ "Boeing's 'More Electric' 787 Dreamliner Spurs Engine Development". DesignNews. UBM Americas. June 4, 2007. Retrieved October 17, 2018. ^ Coldicott, Steve (April 3, 2007). "AIRBUS A380 lands in the City of Angels". International Airport Review. Russell Publishing Ltd. Retrieved October 17, 2018. ^ Kingsley-Jones, Max (September 21, 2007). "Airbus rolls out A350 XWB design revisions". FlightGlobal. Reed Business International Ltd. Retrieved October 17, 2018. ^ Johnsson, Julie (June 19, 2007). "Airbus lands big orders as Paris Air Show opens". Chicago Tribune. p. sec. 3, 1. Retrieved October 20, 2018. ^ Johnsson, Julie (June 19, 2007). "Airbus: Purchases may signal turmoil's end". Chicago Tribune. p. sec. 3, 6. Retrieved October 20, 2018. ^ Pocock, Chris (June 27, 2007). "F-35 Joint Strike Program Proceeds Apace". AINonline. Convention News Co., Inc. Retrieved October 20, 2018. ^ "Heron TP (Eitan)". Defense Update, International, Online Defense Magazine. Defense Update. July 17, 2011. Retrieved October 20, 2018. ^ Walters, Brian (June 26, 2007). "Easy-to-fly AeroQuad uses a coaxial rotor". AINonline. Convention News Co., Inc. Retrieved October 17, 2018. ^ "Religious ceremonies for the victims of flight AF 447". Air France. 2009-06-05. Retrieved 2009-06-12. ^ "Salon du Bourget 15/21 juin 2015". salon-du-bourget.fr. Retrieved 13 June 2015. ^ Un A380 heurte un bâtiment au Bourget ("A380 clips a building") Archived 2011-06-22 at the Wayback Machine, TF1 News, 19 juin 2011. ^ a b L'A380 volera tout de même au salon du Bourget ("A380 will still fly at Paris Air Show"), La Tribune, 20 juin 2011. ^ "2015 Show report". GIFAS. ^ "Aircraft orders report - Paris Air Show 2017". Flightglobal. June 2017. ^ Swopes, Bryan. "3 June 1961". This Day In Aviation. Retrieved 26 March 2019. ^ "ASN Wikibase Occurrence # 154902". Aviation Safety Network. Retrieved 26 March 2019. ^ "Pilot Killed As Copter Crashes at Paris Show". Cincinnati Enquirer. Ohio, Cincinnati. AP. June 6, 1969. p. 38. Retrieved September 20, 2018 – via Newspapers.com. Wikimedia Commons has media related to Paris Air Show.